Current conditions in Ecuador may present a window of opportunity for progress on land tenure and property rights, for three primary reasons. First, the 2008 Ecuadorian Constitution and progressive legislation such as the new Public Finance and Planning Code, the Decentratization Code, the National Territorial Strategy, and the National Plan for Well Being have increased effective representation of all Ecuadorians and created opportunities for public participation in political processes, including advocating for improved land rights and support for the rule of law. Second, a growing awareness of the importance of environmental issues in Ecuador provides an opportunity to bring tenure issues to the forefront, as they are closely related to conservation of biodiversity and use of natural resources including land, water and forests. Third, USAID program success in the areas of conservation, protection of biodiversity, and land titling and registration may provide a platform for increased activity in all of these areas. Decentralization has provided local governments with the opportunity to have a greater voice in land matters, but some local governments lack the capacity to take advantage of the recently devolved authority. Through its Municipal Strengthening Project, USAID is providing technical expertise to promote effective and accountable governance at local levels. The project plans to provide at least 20 local governments with training and technical support for institutional strengthening, income generation, and civil society participation. The Municipal Strengthening Project creates an opportunity for the GOE to strengthen capacity in land administration at the local level. Working with the framework created for the Municipal Strengthening Project and drawing on the experience implementing the USAID Integrated Management of Indigenous Lands Project, USAID and other donors could extend the scope of the assistance provided to local governments to include capacity building and institutional strengthening to support land administration functions through technical training and assistance developing and refining systems and procedures. Empirical data on land markets in Ecuador is old and much of the secondary research is anecdotal or limited to discussion of general trends. It is important to understand levels of formality and informality in the land markets, and to quantify numbers of titleholders and registered parcels. Also, more is needed to understand the reasons for legal and institutional constraints on land market development. As part of more general support for the decentralization process, USAID and other donors could work with the GOE and local government institutions to undertake a comprehensive assessment of the status of rural and urban land market development and analyze the legal, institutional, political, economic, and cultural reasons for weak land market development. Registration records are outdated for over half of all rural properties, and an additional 12% of rural properties lack titles. Registering a land transaction takes upward of a year, and the administrative structure for registration and titling can in some cases be duplicative and lack transparency. USAID and other donors could work with the GOE to improve, update, and simplify the land titling and registration systems for both rural and urban land. Increased numbers of migrants to urban areas and natural population growth in the cities have propelled rising demand for housing in urban areas. At the same time, constraints in the formal market, such as a lack of land suitable for development, have kept prices for housing in the formal sector out of reach for the poor and for many middle-income families as well. Land invasions have ensured and informal settlements are common. Most urban poor have insecure land rights and their living conditions are inadequate. The GOE is implementing a new program through the Ecuador Institute of Social Welfare (IESS) to provide poor families with a subsidy and bank credit for housing purchases. USAID and other donors could help the GOE ensure that the new program provides the intended benefits to poor families by conducting baseline and preliminary research and surveys of vulnerable populations, developing targeted pilot programs, creating procedures and processes for the program that ensure its benefits reach the most marginalized groups, and helping local NGOs identify beneficiaries and support their participation in the program. Donors can also provide the GOE with technical assistance and support for plans to formalize the rights of poor families to plots in informal settlements and help to identify and address barriers preventing poor people from accessing the formal land and housing markets in urban areas in the future. Although the law provides that women enjoy the same land rights as men, this is not the case in practice. Additional research is needed to determine how to make this legal equality a reality on the ground, especially in regard to land titling and registration. Any future donor initiatives related to land titling, registration, or conflict resolution should incorporate strong gender components specifically aimed at promoting women’s rights to land. Indigenous territories are critical in Ecuador because they cover a fifth of the country and indigenous peoples are among the most marginalized in Latin America. Many indigenous peoples have a long-term vision that combines biodiversity conservation with sustainable use of renewable resources in a strategy to improve the quality of their lives. USAID and other donors have been active supporters of projects to formalize the rights of indigenous communities and provide them with the technical and institutional resources to manage their land. These efforts — including USAID’s Conservation of Indigenous Territories project, Initiative for Conservation in the Andean Amazon, and Sustainable Coasts and Forests project – will be generating a substantial amount of data and experience that could be useful to the development of expanded and related programs. USAID and other donors can help ensure that project experience is captured and evaluated and lessons learned and best practices collected and disseminated in order to inform the refinement and expansion of current projects and development of follow on projects. Ecuador‘s ecosystems are under extreme pressure. The country‘s high deforestation rate is a result of oil exploration, logging, road-building, and market demand for agricultural products such as daily, meat, and palm oil. However, the GOE is committed to combating further environmental degradation through the ―Nature‘s Bill of Rights‖ in the 2008 Constitution, and as a member of the Amazon Cooperation Treaty Organization (ACTO), which has developed criteria and indicators for sustainable forest management and a platform for dialogue between national forestry authorities and through its efforts to achieve REDD+ readiness. (REDD+ is an effort to create a financial value for the carbon stored in forests, offering incentives for developing countries to reduce emissions from forested lands and invest in low-carbon paths to sustainable development.). USAID and other donors could build upon Ecuador’s commitment to combating deforestation by supporting programs that protect existing forests, restore degraded forests, promote sustainable livelihood activities for local communities outside of forest areas, and encourage dialogue among all stakeholders currently using forest resources. Ecuador is a small and densely populated country and has the 11th highest rate of biodiversity in the world. Land distribution within the country is highly unequal along geographic and class lines; a result of this is that the rural poor tend to work in agriculture, have limited or no access to land, and work low-productivity land. Rapid urbanization and increased informality have put pressure on Ecuador‘s cities to provide land, housing, and infrastructure. The current status of land ownership, which is fragmented, is a function of changing patterns of land tenure and land ownership in the urban periphery driven, in part, by land reform policies. The legal framework for land tenure and property rights, though well intentioned, has been limited by gaps or contradictions in laws, lack of implementation, poor intergovernmental coordination, and corruption. The institutional framework to support laws has been constrained by limited financial resources, continually shifting mandates and responsibilities, and lack of capacity. Securing formal property rights through titling remains a significant challenge. Registration records are outdated for over half (60%) of all rural properties, and 12% of rural properties lack title. The titling and registration system is characterized by a lack of accessibility, lack of resources, high transaction costs, slowness, corruption, and lack of transparency. Squatting in both urban and rural areas is common. The GOE has been progressive in recognizing and formalizing land rights of indigenous groups, but conflicts exist between the state and indigenous groups as they relate to ownership, use, and access rights. Women‘s land rights are divided along customary and legal lines. While formally women enjoy equal rights, they are less able to own land and have secure access to loan and credit markets. In some regions of Ecuador, however, women constitute a majority of landowners because of the particular characteristics of land tenure practices in those regions. It is difficult to assess the current status of the land market empirically due to a dearth of data on land transactions in both urban and rural areas. What is known is that the market is distorted by a preponderance of informal land sales, rentals, and leases. Within Ecuador, land-related conflicts exist at many levels: between indigenous groups and settlers; between communities and private sector industry; and between illegal settlers and property owners. Ecuador is rich in water, forest, and mineral resources. However, stresses on water systems, ongoing deforestation, and land conflicts associated with mining pose significant threats to the stability and biodiversity of the country. Ecuador is one of the smallest countries in South America with a total land area of 256,370 square kilometers. The country‘s land area was reduced by 20,430 square kilometers (from 276,800 sq. km) as a result of a border agreement with Peru in 1998. The country is composed of: tropical rainforest, including cloud forest above 2,000 meters; a dry deciduous forest along the southern coast; savanna in the south; desert in the extreme southwest; and dry forest, grass, and steppe in the Andean region. Of total land area, 27% is agricultural land, 39% is forested, and 23% is protected. Of total cropland, 29% is irrigated (Food and Agriculture Organization (FAO) 2002; World Bank 2009; European Commission (EC) 2007; World Bank 2011; USDOS 2010; USIP 1998). Ecuador is also the most densely populated country in South America. As of 2008, the total population was 13,479,000, and preliminary results of the 2010 census show the population has grown to 14.3 million. Thirty-four percent of the population is rural and approximately 38% live below the national poverty line (2006 data) (Aguilar and Vlosky 2005; World Bank 2009; Geohive 2011). Ecuador‘s Gross Domestic Product (GDP) is composed of 7% agriculture, livestock, and forestry, 36% industry and 57% services. Though only contributing 7% of GDP, agriculture employs roughly 30% of the labor force. 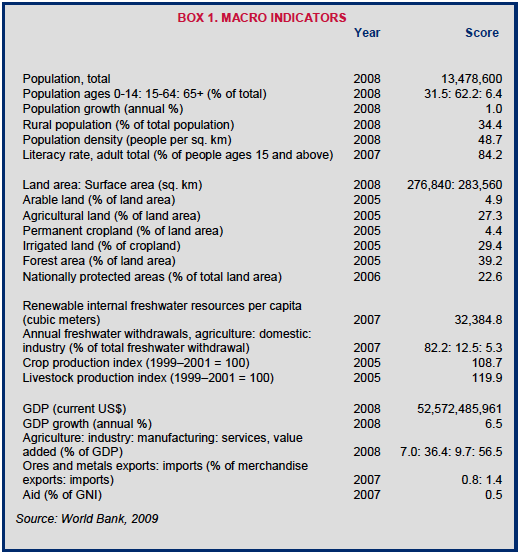 The rural population is dependent on agriculture; however, according to the World Bank the sector suffers from problems including low productivity, limited diversification, high vulnerability to natural disasters, insufficient quality control, and irregular land titling (World Bank 2009; Aguilar and Vlosky 2005; World Bank 2007). Ecuador has more than 1,856 total known animal species, giving the country the 11th highest rate of biodiversity in the world. This biodiversity is partially dependent on the Andes mountain chain, which protects flora in habitat islands. Through logging and agricultural growth, the country loses an estimated 100,000 hectares of forest per year. This lost of forestland threatens many endemic species of both flora and fauna (Aguilar and Vlosky 2005). The Galapagos Islands, a UNESCO World Heritage Site, are protected as National Reserves; however, the government and the United Nations have declared the Islands an emergency area due to the sustained degradation of the area (World Bank 2009; EC 2007). Land distribution remains highly unequal along geographical and economic class lines, although not quite to the same degree as in most other Latin American countries. This inequality in distribution is considered a function of Ecuador‘s historical legacy and lack of well functioning land markets. According to a 2000 agricultural census, farms with less than five hectares comprised 63% of all holdings, but occupied 6.3% of agricultural land. On the other end of the spectrum, farms with more than 200 hectares comprised less than 1% of the country‘s 842, 882 land holdings, but occupied 29% of agricultural land. Middle-sized holdings (5–100 hectares) were relatively evenly dispersed, with the categories of 5–20 hectares, 20–30 hectares, and 50–100 hectares each comprising between 14–19% of all agricultural land. Fifty-one percent of Ecuador‘s total land area is held by just 6% of the country‘s 842,882 landholders. Of total land holdings, 67% are in the Sierra region, 26% in the Costa, and the rest are in the Oriente (Sanchez-Paramo 2005; FAO 2002). Despite attempts at land reform, as discussed further under the section on Legal Framework, below, large landowners have been able to retain fertile valley lands, with the poor generally relegated to marginal land. Small farmers receive no government assistance or services to make the plots productive in rural areas. The rural poor – 60% of the total rural population – tend to work in agriculture, have limited or no access to land, and work on low productivity land. In areas like Valle del Chota (Imbabura and Carchi provinces), land reforms did little to alter historically skewed land distribution patterns. Where Afro-Ecuadorian members of the community were awarded small plots of land (typically five hectares) under reform schemes in the 1960s and 1970s, they have often sub-divided them among their heirs, and the landholdings are now insufficient to support those living and working on the land. Most productive land has remained in the hands of large landowners in this area (Country-Data.com 2009; EC 2007; GOE 2000; Rapoport Delegation 2009). Rapid urbanization has increased the number of poor people living in urban areas from 1.1 million to 3.5 million and the annual rate of urbanization between 2005 and 2010 was 2.1%. Urban growth has been most prevalent in Guayaquil and Quito, which, according to last census, contain 48% of the total urban population of the country, and 27% of the population of the country as a whole. The current status of urban land ownership, which is fragmented, is a function of changing patterns of land tenure and land ownership in the urban periphery driven by land reform policies. For example, in what is now the Quito Metropolitan area, the first national Agrarian Reform Law of 1964 resulted in the splitting up of the many larger hacienda holdings of colonial times into small lots for distribution to poor landless farmers. The difficulties of conducting economically productive agriculture on very small lots, as well as the emerging private land market, led to the sale of many of these holdings and their conversion to urban land uses. Land reforms also fueled speculation and large landowners either subdivided their land illegally in parcels for urban development initiatives or individual sales to urban poor seeking housing sites (FAO 2007). Ecuador has the largest refugee population in Latin America, with some 20,000 registered refugees and 37,000 asylum seekers, though it is estimated that between 130,000–140,000 people may be in need of international protection. The majority are fleeing Colombia‘s internal armed conflict. Approximately 60% are located within urban areas (UNHCR 2010). Under the 1998 Ecuadorian Constitution, indigenous communities have had legal ownership of the land in their ancestral territories, constituting approximately 6.4 million hectares, primarily in the eastern lowlands and northwestern part of the country. The 2008 Constitution, discussed immediately below, further strengthened land claims for indigenous groups (FAO 2006; GOE Constitution 2008). The Constitution of Ecuador of 1998 guaranteed individual private ownership of land, except in regards to ancestral community land. The legal framework outlined by the Constitution allows for the regularization of land tenure and the registration of property. The 2008 Constitution of Ecuador grants indigenous communities titular authority over more than half of Ecuador‘s remaining forestland. It also states that land belonging to ancestral communities is not divisible, conveyable, or subject to legal attachment. This constitutional rule takes precedence over the general principles of private rural property established in the 1994 Agrarian Development Act (USAID 2006; Inter-American Development Bank (IDB) 2004; GOE Constitution 2008). The Agrarian Development Act of 1994 sought to facilitate market transactions and strengthen land markets in Ecuador. The law gives indigenous, Afro-Ecuadorean and campesino (peasant) communities more direct input in the process of implementing agrarian development policy. The law explicitly recognized the right of indigenous peoples to continue their traditional forms of life (FAO 2002; Inter-American Commission on Human Rights (IACHR) 1997). The Forestry Law of 1981 established forestry, natural areas (parks and reserves), and ―protective forest and vegetation‖ as ―Heritage of the Nation‖ land categories. The law sets forth protections for each category through special restrictions on use and exploitation. Implementation of these protections has remained weak, however (World Bank 2003; Environmental Law Institute (ELI) 2003). The Land Reform, Idle Lands, and Settlement Act of 1964 outlawed the huasipungo system (the Ecuadorian system of sharecropping). The law also established the Ecuadorian Institute of Agrarian Reform and Settlement (IERAC) to administer the law and to expropriate and redistribute idle arable land to farmers. Squatters were given the right to acquire title to land they had worked for three years. The law was amended in the early 1970s to require that all land held by absentee landlords be sold to tenants. Despite many financial and political impediments, this amendment led to a redistribution of over 700,000 hectares to nearly 80,000 peasants over the next decade. In many cases, however, the redistributed land was of poor quality or badly located (in mountainous regions), as landlords kept the best land for themselves. Also, the law was later amended to protect efficiently run farms from expropriation. An agricultural census taken after the implementation of the 1964 law showed that highly unequal land distribution persisted. Although 75% of all farms were occupied by their owners, these were often very small, poorly located ―minifundios.‖ Tenants remained to occupy and work 12% of all farms, and sharecroppers cultivated an additional 7% (Country-Data.com 2009; Plant and Hvalkof 2001; FAO 2002; ELI 2003). The revised 2008 Constitution of Ecuador recognizes and guarantees the right to property in the following forms: public, private, communal, state, and associative (GOE Constitution 2008). Under the Law of the Communas in 1936, many traditional land tenure arrangements were formally recognized. The government has granted ancestral land to specific organized groups including indigenous peoples and Afro-Ecuadorans recognized by the GOE. Indigenous land tenure rights generally fall within three main tenure types: indigenous reserves, community tenure, and protected areas. In indigenous reserves, groups are given legal communal title to large land areas containing multiple communities. In community tenure, communities are given legal title through customary land tenure laws. In protected areas, the state maintains public ownership of the land; however, indigenous inhabitants are granted legal use rights (Becker and Gibson 1998; Bremner and Lu 2006). Land rights are acquired through purchase, inheritance, appropriation, and designation of personal use within communal lands. Land may be titled through Direct Administration or by Convenio (Agreement). The National Institute for Agrarian Development (INDA) is directly responsible for titling by direct administration through local or regional authorities (FAO 2002). Some properties in Ecuador lack title, and many property records are outdated. The IDB estimates that 60% of the 2.7 million rural properties in the country lack current records, and an additional 12% of all rural properties lack titles. In many cities, urban residents live on plots of land that they do not formally own (IDB 2010; Lanjuow and Levy 2002). Land titling is complicated by the fact that there are two organizations involved in the process: the National Institute of Agrarian Development, within the executive branch; and the local official of the Notary Public and Municipal (county) office, within the judicial branch. According to various studies, neither of these offices has sufficient resources to manage the land titling and registration process. The system is also characterized by a lack of accessibility, high costs, slowness, corruption, arbitrariness, and political capture. Pernicious corruption in the processing of public contracts in Ecuador has led to completely inadequate service provision. In some instances, public contracts involved bribes of between 10%–30%. There are instances in which INDA officials grant land titles to private lands to the highest bidder, which can only be reversed by administrative appeals to higher authorities within INDA (IDB 2004; Macours et al. 2002; Doig and Riley 1998; ELI 2003). In rural areas, the judicial system does not adequately protect property owners‘ rights. Squatter groups commonly seize agricultural land held by foreign and local investors. Overnight, large numbers of people, often led by a dirigente (organizer), arrive to squat on a piece of land where they build temporary shelters. These groups rely on the weight of their numbers to help them avoid eviction. Agrarian reform authorities often recognize squatters‘ claims to the land with minimal or no compensation paid to landowners (Lanjuow and Levy 2002; United States Agency for International Development (USDOS) 2006). Urban informality is also a significant problem. Between 1990 and 2000 (most recent statistics), over 441,000 informal houses were built in Ecuadorian cities to house the poor, who have limited access to the formal housing market. Approximately 50% of Quito residents live in the informal sector, obtaining their property either through land invasions or through the informal housing market. In Guayaquil informality was estimated at 67% in 2000, up from 59% in 1993. In 1992 the municipality of Guayaquil created an urban planning department for the purpose of land regularization. In 1994 a city ordinance was approved that authorized the sale of municipal lots to squatters who had occupied the land for at least a year. Between 1993 and 2000, 103,000 property titles were distributed, representing the vast majority of Guayaquil‘s territory (Rose 2006). Collective property titles may also be given to a group of persons who share a common interest in the land, such as indigenous communities. When seeking title by Convenio, physical/natural or juridical persons sign agreements with INDA to legalize land tenancy of third parties. With the support of USAID and other agencies and donors, non-governmental organizations (NGOs) such as Ecuadorian Fund for Popular Progress (FEPP) have been helping indigenous groups establish boundaries and title indigenous land (FAO 2002; USAID 2011a). Ecuador‘s laws provide many fundamental protections for women‘s property rights, as reflected in the low scores Ecuador achieves in the Organisation for Economic Co-operation and Development (OECD)‘s database measuring gender inequality, noted in Box 3. (The OECD rankings are based on the question of whether or not women can own land and property, as indeed they (legally) can in Ecuador.) Women in Ecuador are presumed to share in property and income acquired during the marriage. In 1982, Ecuador recognized the same rights for consensual relationships as for legal marriages. This diverged from the previous law, under which women in consensual unions had no property protection. There are no apparent restrictions on women‘s inheritance rights; they can act as both executors and administrators of wills. Inheritance laws stipulate that a wife will receive one half of marital property and that the remainder will be divided among surviving children. (Deere et al. 1999; Deere and León 2001; Martindale Hubbell 2008; FAO 2002). In communities where male emigration is common, such as the highlands of south-central Ecuador, women experience a more gender equitable inheritance system. Land ownership has become increasingly feminized as land has diminished as a source of power and income within the community (Jokisch 2002; Deere and León 2003). At the time of the 2002 Agricultural Census, 19% of women owned land. In certain areas of the Andes, vestiges of the indigenous parallel inheritance system (an ancient Andean norm in which women inherit land from their mothers and men inherit from their fathers) remain. For example, in Chachalo more than 75% of women own land. This is a higher proportion than that of male landowners. This can be linked to the greater visibility and recognition of women‘s agricultural abilities within these communities (GOE 2000; Deere and León 2001). Access to credit markets poses one of the most serious problems for women. According to a national agricultural survey taken in 2000, the proportion of women agricultural producers who had been granted a loan was approximately half that of men producers. This appeared to be true despite the fact that formal laws and regulations for credit do not discriminate against women in Ecuador (see Box 3) (Convention on the Elimination of All Forms of Discrimination against Women (CEDAW) 2007). Ecuadorian institutions responsible for land administration are in a state of continuous change and experience frequent changes in leaders and staff at all levels of government. In many cases the GOE has developed progressive environmental laws which recognize the rights of indigenous people. However, the administrative and institutional framework to realize these and other land tenure and property rights goals inherent in existing laws is weak (FAO 2002). The National Agrarian Development Administration (INDA), which reports to the Ministry of Agriculture (MAG), is responsible for the assessment, adjudication, and transfer of ownership of public rural land that is in conflict or without clear title, except in cases in which the land is the responsibility of the Ministry of the Environment. Land titling is also under the jurisdiction if INDA, as well as the notary public and municipal (county) offices at the local level (IDB 2004; FAO 2002). The National Directorate of Property Assessment and Cadastres (DINAC) reports to the Ministry of Urban Development and Housing (MIDUVI). DINAC maintains the national cadastral information system (IDB 2004). Municipalities maintain urban and rural cadastres for the cantons that they govern. The Association of Ecuadorian Municipalities) (AME) was established and is financed by both the municipalities and by external funds. AME supports its members through fiscal cadastres and financial administration (IDB 2004). 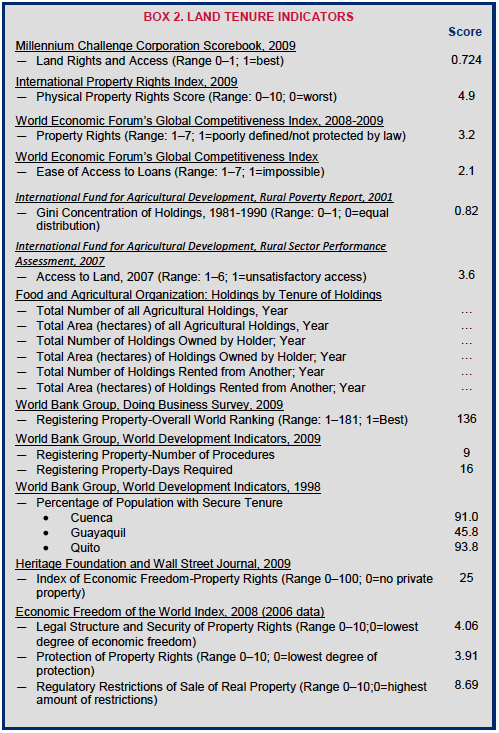 There is a dearth of current data relating to land market development in Ecuador. What is known is that the informal land market is significant, due to the fact that most land is not titled. Further, only a fraction of those parcels that are titled are registered. Only registered land can be bought, sold, or leased (Macours et al. 2002). Formal land rental markets are also small and characterized by segmentation: on the one hand there is formal commercial rental activity, and on the other hand land is rented informally, within narrow (local) circles of confidence, with very few written contracts and primarily on a short-term basis and short-term contracts (ibid.). Registering a property transaction in Ecuador required nine procedures, took 16 days, and cost approximately 2.2% of the property‘s value in 2010. The World Bank ranks Ecuador number 69 in the world in terms of ease of registering a property transaction (World Bank 2010). Access to loans for housing and land is scarce, particularly for women and the poor. In the past, commercial banks played an important role in financing medium and high income groups for housing, but in the midst of economic downturns over the past decade banks have lessened the number of mortgages in their portfolios (Fretes-Cibils et al. 2003). Poor land market functioning emanates from a variety of deficiencies including transaction costs, transaction time, and the inability of the National Institute of Agrarian Development (INDA) to efficiently carry out duties because of political, institutional, and financial limitations (FAO 2002). Ecuadorian law provides for appropriate compensation in cases of expropriation by the government. The individual has the right to petition a judge to establish an appropriate price for expropriated holdings. Under the Agrarian Development Law, grounds for expropriation of agricultural land are limited and land cases are subject to the jurisdiction of regular courts (USDOS 2006). Ecuador‘s judicial system has often both failed to provide adequate protection from unlawful expropriations and to provide landowners with prompt, adequate, and effective compensation for property that has been expropriated (USDOS 2006). (USDOS 2006). Land disputes in Ecuador are common. Disputes are often caused by a lack of ability to obtain or recover land through legal means, ambiguity of property boundaries, lack of land title, and discord over access to natural resources (Plant and Hvalkof 2001; Chiriboga and Jara 2005). The Supreme Court can intervene in land disputes; however, rule of law in Ecuador is weak. At one point, the country went a year without a functioning Supreme Court. Critics state that despite efforts to depoliticize and modernize the court system, the resource-starved judiciary continues to operate slowly and inefficiently. 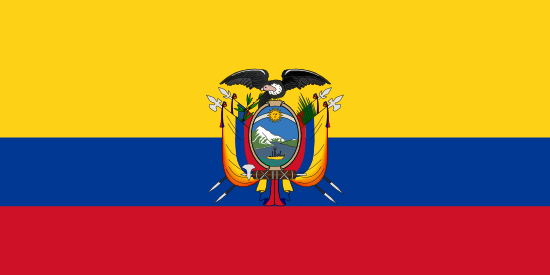 Ecuador has over 55,000 laws and regulations in force and many of these are conflicting, which facilitates arbitrary and capricious judicial decisions (IDB 2004; USDOS 2006). Land disputes in Ecuador are often characterized by conflict between communities and private sector industry. For example, in September 2009, a group of Shuar Indians (indigenous peoples from Ecuador‘s Amazon) blockaded a highway and fought with Ecuadorian police. The Shuar fear that draft mining and water laws would allow mining on their lands without their consent and lead to the privatization of water (Valdivieso 2009). Conflicts over land are widespread within the National System of Protected Areas (SNAP). Approximately 60% of the eight million hectares held by SNAP are under land ownership conflict. The most common cases of conflict in SNAP are disputes over: (1) lack of coordination between INDA and the Environmental Authority on demarcation of their jurisdiction; (2) ancestral communal properties lacking registered titles; (3) illegal individual occupations; and (4) conflicting claims between de facto occupants and absentee legal owners (FAO 2002). Despite past attempts at land reform in Ecuador, land distribution remains highly unequal, and rural poverty is closely tied to the landlessness and near-landlessness of many poor households. Large landowners have been able to retain fertile valley lands, with the poor generally relegated to very small plots – often under one hectare – on marginal land. Small farmers receive little if any government assistance or services to increase productivity on their plots. Incidents of rural land invasions by the poor are common (Country-Data.com 2009; EC 2007; GOE 2000; Lanjuow and Levy 2002; USDOS 2006). In urban areas, the poor have little access to formal land and housing markets, and the growth of informal settlements has paralleled the growth of urban populations. Upward of 50% of the urban population is housed informally, with levels exceeding 65% in Guayaquil (FAO 2007; Rose 2006). The inadequacy of the land titling and registration systems in Ecuador leaves many rights unclear and insecure. Property records are outdated, and a significant number of land plots are not legally titled. Administrative systems for titling and registration suffer from overlapping mandates, are under-funded, and reportedly corrupt. Legalizing one hectare of land takes more than a year (FAO 2002; Lanjuow and Levy 2002; IDB 2004; Macours et al. 2002; Doig and Riley 1998; Environmental Law Institute (ELI) 2003). In 2008, Ecuador adopted a new constitution with strong protection of indigenous authority over traditional lands and forest resources (GOE Constitution 2008). The extent to which these protections will change future law and/or policy in Ecuador is not yet clear. Since 2003, USAID programs have focused on improving management of natural land areas, establishing indigenous territorial boundaries, implementing control and vigilance systems, facilitating legal land titling, and mitigating conflict. USAID supported the delimitation of 636 square kilometers of Cofan, Waorani and Chachi lands and the cartographic delimination of 780,000 hectares in the Tagaeri Taromenae area, which created the basis for the 700,000-hectare Intangible Zone in the Yasuni. USAID has also supported conflict management and mitigation with the Awa and Cofan in Columbia and Ecuador and between indigenous groups responsible for the administration of ancestral lands and colonists (USAID 2009; USAID 2011a). The IDB has supported improvements to the land titling and registration system in Ecuador since 2002. Its initial project ended in 2009, and its new project, based on a US $90 million loan, seeks to regularize land tenure and help the GOE to establish efficient cadastral management and rural property registration. The project aims to bolster the legal tenure status for around 314,000 properties, and update registration records for 800,000 rural properties (of an estimated total of 2.7 million rural properties) (IDB 2010; IDB 2004). USAID is implementing the US$ 6 million Conservation of Indigenous Territories Project (2007-2011). The purpose of this program is to respond to threats faced by lowland indigenous groups in northern Ecuador and in the Amazon Basin. The objective is being achieved by helping indigenous groups secure and exercise land rights, build the technical, financial, and administrative capacity for indigenous organizations to manage their lands effectively, promote the sustainability of conservation initiatives within their territories, and assess impacts of infrastructure development and immigration on their territories. As of December 2010, the project has helped put 1.9 million hectares of Awa, Cofan, Waorani, and other indigenous territories under improved management through the establishment of boundaries, implementation of control and surveillance systems, and conflict mitigation (USAID 2011a). Through its US$ 13.3 million Sustainable Forests and Coasts project (2009-2014), USAID seeks to improve biodiversity conservation in critical coastal and forest areas as well as improve livelihoods for local populations. The project works with communities and producers on strategies of sustainable, environmentally-responsible use and market development. As of December 2010, the project had helped place 271,391 hectares of biologically significant land and coastal marine areas under improved environmental management and provided 2,970 people with increased economic benefits from sustainable natural resource management (USAID 2011b). The USAID Initiative for Conservation in the Andean Amazon (ICAA) (2006-2011) aims to strengthen Amazon indigenous organizations and improve the protection and management of four large landscapes in Ecuador and Peru through building constituencies and agreements among the large number of public and prívate organizations working in the region. As of the end of 2010, the Project had helped complete a land use study in northern Ecuador to determine the baseline for deforestation and changes in land use patterns. The Project also supported the creation of a 70,000 hectare muncipal conservation area and helped train local officials and build local community capacity for long term environmentally-sustainable management of land (USAID 2011c). The World Bank supported the preparation of a draft bill to propose the Special Law for the Conservation and Sustainable use of the Biodiversity in Ecuador. This law would support the adjudication and titling of ancestral possession lands, located in restricted or protected areas, to indigenous and Afro-Ecuadorian people. The agency also supported conservation training for students (World Bank 2003). FEPP, a non-profit organization initiated by the Roman Catholic Church, has implemented a market based land purchase and titling project with funding from the International Fund for Agriculture Development (IFAD). The project was successful in acquiring land for the landless through market mechanisms (Chiriboga and Jara 2005). Ecuador has ample water resources. The country has four times more water per person than the global average; however, water resources are dependent on forests. Some areas have experienced prolonged drought and/or extreme flooding, which may be linked to increased deforestation. Inappropriate and inequitable water distribution exacerbates an overall reduction of water reserves. Water availability is also negatively affected by erosion of river banks, population growth and increasing urbanization, growth in agricultural production and a corresponding need for irrigation, and poor water systems planning (FAO 2006; Ramazotti 2008; IDB 2008). While increasing numbers of Ecuadorians have access to clean water and sanitation, recent estimates indicate that more than half of all families lack access to water and adequate sanitation (IDB 2008). Government capacity to manage public water resources is weak. There are no plans to establish any sort of water quality control system (Ramazotti 2008). The 2008 Constitution and the Water Law of 1972, as revised in 2004, are the most important legal documents affecting ownership and control of water. Together they establish the general principle that water is a national good for public use and that individuals cannot appropriate water without authorization. The 2008 Constitution establishes strong governmental authority for conservation, management, and recovery of water resources, including water shed areas. Land ownership does not include rights over surface or underground waters (Ramazotti 2008; GOE Constitution 2008; GOE Water Law Reform Law 2004). The Water Law provides that the use of water resources is subject to the granting of a concession by the National Secretariat for Water (SENAGUA). Concessions are not required for drinking water, livestock, or bathing purposes, however. Domestic and drinking uses take priority over other types of use. Revisions to the Water Law in 2004 (Ley Reformatoria a la Ley de Aguas) provided for the establishment of Water Boards and Irrigation Boards with authority to collect fees for water use and develop and maintain necessary infrastructure (Caponera 1992; Senagua 2011; GOE Water Law Reform Law 2004). Generally, the collective rights of indigenous peoples and nationalities have been increasingly recognized by the Ecuadorian legal system. Customary law regarding water use is not officially recognized because the legal framework on water resources merely indicates that water is a national good for public use. Thus, customary rights are insecure when in conflict with statutory rights. However, there is a legal regime set forth in the estatutos internos (internal statutes) and ley de todos (laws for all members), which establishes water management rights and obligations of all members within indigenous or ancestral groups (Ramazotti 2008). The state has ownership and dominion of all water resources in Ecuador. Water use rights are allocated via a system of concessions established by the Water Law. Conflicts arise due to an inadequate system of water concession registration that sometimes causes the same license to be granted to more than one user. In other cases, water supply is not sufficient to sustain the concession (Ramazotti 2008). Under customary practices, water is regarded as sacred and belongs to communities. In indigenous communities in Ecuador individuals have a right to use water and irrigation infrastructure as part of a shared resource. Individual users participate in and pay use fees to water user associations. They also contribute their labor to help maintain irrigation infrastructure. This communal process is used as a method by which rights over the water are acquired and strengthened (Ramazotti 2008). As of 2008, the National Secretariat for Water (SENAGUA) assumed governing authority over Ecuador‘s water resources, replacing the National Water Resources Council. SENAGUA‘s objectives include: encouraging sector policies and regulations supporting the preservation, conservation, and sustainable use of water resources; promoting the protection of watersheds; and promoting the social management of water resources (Senagua 2011). The Ministry of Urban Housing and Development (MIDUVI) and the Sub-secretary for Potable Water, Sanitation, and Solid Residuals (SAPSRS) determine the nationwide water development strategy and design implementing policies and regulations (World Bank 2005). The Ministry of Public Health regulates the quality of potable water (World Bank 2005). Environmental protection and the control of water pollution are the responsibility of the Ministry of the Environment (World Bank 2005). Municipalities receive financial resources for water projects from the Ecuadorian Development Bank (BEDE) (World Bank 2005). The provinces are charged with maintaining watersheds and water infrastructure (Ramazotti 2008). The government is considering proposals to reform the Water Law, and SENAGUA has been introducing the issues in meetings around the country. Some interpret the proposed law as authorizing partial privatization of water use and control, weakening pollution control laws, and reallocating water use to industry. The law is very controversial in Ecuador and has sparked protests, some of them violent (CNN 2009; Resource Center for Rights of Indigenous Peoples (RCRIP) 2009; Senagua 2011). The Rural and Small Towns Water Supply and Sanitation Project (PRAGUAS) is the government‘s principal vehicle for improving water supply, quality, and sanitation in rural areas (World Bank 2005). In addition to biodiversity projects, USAID is involved in the development of potable water projects. The Agency and other donors have supported the Fund for the Protection of Water (FONAG), a project to protect drinking water basins that provide water to Quito. The FONAG model is being replicated in other 6 municipalities in Ecuador. The five-year, US$ 3 million USAID Protecting Water Sources to Conserve Biodiversity project (2007-2012) seeks to: 1) assist local governments to improve watershed management, directly benefiting up- and down-stream users; 2) establish financial mechanisms to support long-term investment in watershed and biodiversity conservation; and 3) increase civil society and private sector participation in watershed management, especially through education programs and sustainable productive activities. As of the close of 2010, the project helped protect 382,341 hectares of watershed, helped the Minister of the Environment establish park guards and community oversight groups to monitor protected areas, and helped 13,110 residents reap the benefits of more sustainable economic practices. In addition, USAID‘s US$ 6 million Integrated Municipal Strengthening Program (2010-2013), which began in 2010, will assist local governments in improving productive and social infrastructure, with one objective to maximize the positive health impact of water and sanitation infrastructure (USAID 2011d; USAID 2011e). Earlier this decade the World Bank financed PRAGUAS, which was intended to improve the water supply and sanitation to communities throughout the country (World Bank 2005). The IDB supports development of an integrated water resource management policy focusing on watersheds (IDB 2008). Ecuador has a very rich forest resource base. The country has 11,679,822 hectares of forest, which is comprised of six types: Wet Tropical Forests (rainforests); Dry Tropical Forests; Mangrove Swamp Forest; Flood Plain Forest; Mountain Forests; and Wet and Dry Temperate Forests. These forest types are located in the various regions of the country. There are more than 1,856 total known animal species in Ecuador, giving Ecuador the 11th highest rate of biodiversity in the world. Public forestland is comprised of the National System of Protected Areas (SNAP), which covers around 18% (4.7 million hectares) of inland territory with 34 protected areas; as well as the Protected Public Forests, which cover around 9% of inland territory; and the State Forest Estate (PFE) which covers approximately 8% of the inland territory (Forest Dialog Secretariat 2010). Forests are used for firewood, bamboo, tagua nuts, and the harvest of plywood, balsawood, and ‗raw wood‘ (eucalyptus and teak). Of all wood harvested in the country, 67% is used either as fuel wood, illegally logged or wasted. Between 17.5% and 54% of timber is harvested and traded illegally. As a result, Ecuador‘s rate of deforestation – 1.5% annually – is four times higher than that of other countries in the region. Dry forests are vanishing at a rate of 2.2% per annum. Loss of forestland threatens many endemic plant and animal species (Aguilar and Vlosky 2005; FAO 2006; World Bank 2009). Indigenous communities and the state are the primary forest owners in Ecuador, although many private individuals also claim forestland rights, and land rights conflicts are common. The GOE has made substantial effort in granting land property titles to indigenous communities. Of the approximately 11.7 million hectares of forest, 4.9 million hectares account for forest areas owned or claimed by indigenous peoples, 7.9 million hectares are owned by the state, and 3.9 million hectares are ‗private‘ production units mostly owned by small proprietors with an average of 35 hectares each. The total of these different ownership categories clearly exceeds the total area in forests (by over 40%). This points to a wide overlap in forest rights and has generated significant conflict among indigenous peoples, state authorities and individual holders (Navarro et al. 2006; GOE Constitution 2008). Sustainable use and management of forest resources is a challenge given lack of capacity of both the GOE and indigenous organizations. Key forestry problems to be addressed include: improvement of the economic chain of production; increasing the value of timber and its end products; combating illegal logging; providing technical assistance in forest management; and developing stronger controls in general (FAO 2006; EC 2007). The 2008 Constitution establishes a right of nature to be respected and restored. It also grants broad rights to indigenous and ancestral communities over forestlands and resources. The extent to which these protections will change future law and/or policy in Ecuador is not yet clear (GOE Constitution 2008). The Forest Law of 1958 (34 articles) can be considered Ecuador‘s first modern forest law. It contains the most important elements of current Ecuadorian forest legislation in that forests were divided into production forests, protected forests, and natural areas, with different rules for their management. The Forest Agency was made responsible for limiting those production forests available for colonization, leaving the rest for sustainable lumbering (FAO 2006). The Forest Law of 1981 divided state-owned forest into protected and productive forests, which were to be inventoried and boundaries clarified. The Forest Law was successful in establishing SNAP, but implementation was extremely weak. No national register of forestland – a precondition for obliging private owners to reforest their land – was ever made. Only a third of the state forest was delimited, leaving two-thirds to be freely colonized. Colonization and deforestation went on as usual, even in the inventoried state forests (ELI 2003). In 1994, land tenure legislation was modernized in the Ley de Desarrollo Agrario. Along with the Ley de Tierras Baldías y Colonización of 1964 and the Ley de Colonización de la Región Amazonica Ecuatoriana of 1978, it formed the legal and institutional framework for colonization in the Amazon area. These laws have been severely criticized for making irresponsible colonization in the Amazon area possible (ELI 2003). Current policy and legislative reforms have emanated in part from the proliferation of illegal logging activities and deforestation. In 1999, with the recognition that the state had limited resources and capacity to maintain forest resources, the GOE adopted the Strategy for Sustainable Forestry Development (SNTCF). It directed the Ministry of Environment to delegate to civil society and the private sector all forest-related functions. This has divided the country into 10 regional forestry districts, which have had operational and budgetary autonomy. The strategy was developed with four main objectives: (1) slow deforestation to give more value to goods and services provided by natural forests; (2) promote the conservation of forests and biodiversity through the sustainable use of biodiversity; (3) recover degraded land through reforestation programs; and (4) increase the participation of forest owners in forest policy development and implementation. The strategy for action outlined by the plan includes: securing forest land tenure in order to give more value to natural forests and forest plantations; promoting and financing sustainable forest management; fostering active social participation of forest stakeholders in implementing policies; modernizing the institutional and organizational setting; and modernizing the legal framework (FAO 2006). To ensure parity with this new policy, the Ministry of Environment opted to modernize the legal framework through a series of legislative and regulatory reforms. In April 2000, Executive Decree No. 346 introduced important changes to the Regulations of the 1981 Forestry and Conservation Law, establishing five basic criteria for sustainable forest management. In 2002, ―Secondary Environmental Legislation‖ provided a legal basis to the already-existing SNTCF by mandating the establishment of the Forest Steward Program and the creation of a public-private control body involving civil society groups, named Green Surveillance (Navarro et al. 2006). The Forest Law was amended in 2000 and 2002 to prohibit extractive exploitation of forest resources inside the protected areas (FAO 2006). The National Biodiversity Strategy Action Plan (2002) supports Ecuador in conserving and sustainably using its biodiversity. The success of the plan will be indicated by: (a) better quality of life for the country‘s population; (b) the optimal use of associated economic, social, and environmental resources; and (c) the equitable distribution of the costs and benefits of the country‘s natural resources throughout the population. To support the success of the plan, the plan proposes four foci: (1) consolidate and strengthen the sustainability of production activities; (2) ensure the existence, integrity, and functionality of ecosystems, species, and genes; (3) balance pressure from sustainable use and conservation; and (4) guarantee individual and collective rights to participate in decisions related to the access and control of resources and ensure that indigenous communities and local populations receive just benefit from the use of resources (CBD 2009). Successful implementation of reforms has been hindered by a variety of obstacles. These include lack of an implementation strategy and a clear transition agenda for actors such as the officials of the MoE and regional authority districts, and weak institutional arrangements to support these laws and policies (Navarro et al. 2006). Though almost all of Ecuador‘s forests are held in private or communal possession, an estimated 50% of these lands have unresolved land tenure issues. The Forest Law states that, within the PFE, no ownership other than that of indigenous groups can be acknowledged. While the government delimited the PFE and SNAP on paper, however, it did not clarify actual boundaries. As a result, management categories overlap and possession/management rights are often unclear between the state and others (including indigenous and ancestral peoples, farming communities and settlers). Also, neither the Forestry Law nor subsequent laws clearly removed land awarded to indigenous and ancestral groups from the PFE, causing confusion. Conflicts frequently occur where a party obtained a legal title deed to land prior to the establishment of the protected area, as the law does not address this situation. Due to the legal ambiguities and incomplete implementation of the formal laws as they pertain to forestlands, the FAO estimated in 2006 that there are approximately two million hectares of forest within the PFE under possession of individual families with unresolved tenure (FAO 2006; Forest Dialogue Secretariat 2010). Indigenous groups control approximately five million hectares of natural forest in the northwest and eastern lowlands. Though entire communities may hold title to communal lands, these lands are not necessarily used collectively. Communal forestland use is determined internally within the local community. Wood companies and traders must acquire a permit from a community representative in order to proceed with timber extraction (FAO 2006). Settlers control approximately 3,881,140 hectares of forest area. In the Amazon region, settlers control large forest areas – 37 hectares per individual farm, compared to 8–18 hectares in coastal and highland areas. Studies estimate that, in the Amazon region, only 34% of farmers hold a legal land title while an additional 12% hold a certificate of possession (FAO 2006). Ecuadorian law has permitted the transfer of public forests to private parties, which promotes land clearing in order to achieve land tenure. Settlement has followed oil development rather than government-selected areas. At present, settlers are confronted with difficulties in land titles, credit, marketing, and tenure conflicts with indigenous populations. Sound resource management is constrained by the tenure regime and government subsidies for conversion of forests to pasture (ELI 2003). Since the 1990s, there have been uprisings on the part of various indigenous groups regarding land tenure and use. Efforts were made in the new laws promulgated in 1994 (the Agrarian Development Law) to assist in the process of recognizing traditional land use; however, this recognition has been complicated by subsequent laws, such as the Forestry Law, which specifies that all land within the borders of legally designated natural reserves must be appropriated by or reverted back to the state. After indigenous uprisings in the early 1990s and then again in the early 2000s, forestry rights were often acquired through presidential decrees and negotiations with the Executive Branch of Government (Plant and Hvalkof 2001; IAHCR 1997). The lack of clarity in forestland tenure rights creates disincentives for efficient management, and contributes to illegal timber harvesting. It also creates obstacles to developing a framework for carbon rights trading in the future, according to observers (FAO 2006; Forest Dialogue Secretariat 2010). The Ministry of Environment oversees protected areas and the Public forests, while INDA, which is under the Ministry of Agriculture and Livestock, oversees areas outside the domain of the ministry. Current government administration includes the National System of Protected Areas, which sometimes overlaps with land tenure issues managed by INDA. The Ministry of Environment and INDA are able to confer titles on public land (FAO 2006). The Ministry of Environment has historically exercised weak and inefficient authority over forests. Forest and conservation policies have lacked priority in Ecuador and there has been an absence of political will supporting the formulation and implementation of new policy (FAO 2006). The government – and particularly The Ministry of Environment – has responded to deforestation through a series of measures. The National Development Plan aims to reduce the rate of deforestation by 30% by 2013. Ecuador has also been active in reaching Reducing Emissions from Deforestation and Degradation (REDD) readiness. Components of the country‘s strategy include implementing four programs: (1) the Socio Bosque Program (an incentive mechanism for conservation that has been in place since 2008); (2) a Forest Information System; (3) a Monitoring, Reporting, and Verification (MRV) System; and (4) the Afforestation and Reforestation program. All four initiatives are currently in progress (Accra Caucus 2010). The scale, scope and sustainability of these initiatives require significant financial and technical resources (ibid.). In the Amazon and coastal regions, USAID and GTZ have assisted indigenous groups in improving management of more than 2 million hectares of their territories as a result of stronger legal rights, regular patrols, delimitation, conflict mitigation, and participatory management plans. Communities also benefited from improved natural resources management, especially for low-impact logging, and subsistence activities. In the Sierra, USAID programs conserved globally endangered species (Wendland 2008; USAID 2009; USAID 2011a). USAID‘s Sustainable Coasts and Forests project, which runs through 2013, seeks to preserve critical forest habitats, improve biodiversity, and help improve livelihoods for local populations. The project had brought 271,391 hectares of biologically significant forest and coastal land under environmental protection by the end of 2010 and expects to bring another 84,000 hectares under improved environmental management in 2011(USAID 2011b). Gold, silver, lead, zinc, copper, iron, coal, and salt are mined in Ecuador. Overall, investment in mining is modest by Andean standards. In 2006, the total value of production by the mineral industry of Ecuador was almost entirely (98.67%) accounted for by the value of production of crude petroleum. Other minerals produced in small quantities include limestone for cement and glass manufacture, and other industrial minerals, such as feldspar, pozzolan, pumice, kaolin, and barite (Anderson 2009). In Ecuador, national policy overwhelmingly supports petroleum extraction. Oil is Ecuador‘s largest grossing national product, and national interest in ensuring its development is critical in light of the country‘s considerable foreign debt (USDOS 2006; USDOS 2009). Under Ecuadorian law, minerals are the property of the state. Any zone may be reserved by the state for its exploitation or exploration. Certain areas, including hydrocarbons, radioactive substances, and mineral water are regulated by special laws beyond those generally applicable to mining. Environmental regulations for mining activities are established by Decree No. 625 of 1997 (Martindale Hubbell 2008). In early 2009, a new mining law was approved by Congress. The law: (1) establishes a state-owned mining company that will have exclusive rights for four years to develop certain ―special mining areas;‖ (2) requires sales royalties to be 5% or higher; (3) provides foreign investors with treatment equal to that of domestic investors; (4) calls for the adoption of tougher environmental and social protections; and (5) creates a new government mining regulator (Kueffner 2009). The new law also allows for the expansion of copper, silver, and gold mining in Ecuador‘s Amazonian and highland regions. It restricts the involvement of indigenous and affected communities by only allowing for the right to consultation in relation to mining activities in their communities. Indigenous and environmental activists have been campaigning against the mining law since it was drafted, and have sought to have it amended (Fertl 2009). The 2009 law has yet to take effect because the National Assembly needs to approve implementing regulations. The law has been challenged in court by the Confederation of Indigenous Nationalities of Ecuador (CONAIE) on the grounds that it is inconsistent with certain provisions of the 2008 Constitution (Santacruz 2009; Kueffner 2009; Earthworks 2009). The GOE owns all mineral rights and controls all mineral activities, either directly or by granting rights to third parties. The GOE has a monopoly over the salt mining industry. The state contracts with private developers for the exploration and exploitation of petroleum and other minerals, with each contract specifying a specific geographical area and time period for exploration or exploitation. If oil is found, the company can enter into a twenty-year exploitation agreement, renewable according to ‗public interest‘ (as determined by the state). While those granted concessions have been guaranteed the right to exploitation, the concessions under privately or publicly owned land are insecure as the government has changed the laws and periodically imposed halts or other limitations (Martindale Hubbell 2008; USDOS 2009; Hite 2004; Kueffner 2009). Foreign investors require approval of the President and the National Security Council of the Armed Forces to obtain mining rights in zones adjacent to international boundaries. In 2000 and 2001, the government eliminated public royalties, reduced the payment of surface rights per hectare, approved mining titles valid for all mining processes for 30 years, and streamlined the concession process. However, the validity of similarly situated concessions was called into question after the Ministry of Energy and Mines unexpectedly canceled some of the concessions in 2003 (USDOS 2009). The constitution recognizes the collective rights of indigenous communities located in mining areas, including the right to own property legally and without charge. However, the state can claim, in the national interest, its own rights over all natural non-renewable resources, all subsoil resources including minerals, and any other substances below the surface. The link between extractive industries in indigenous territories and the violation of indigenous peoples‘ basic rights, including land tenure and property rights, has been illuminated at the national and international levels by Ecuadorian indigenous organizations and federations (UN-Habitat and OHCHR 2005; Fertl 2009). The National Directorate of Mining has authority over the mining sector. The Geological Mining and Metallurgical Research and Development Corporation charged with implementation of mining policy (Martindale Hubbell 2008). In 2005, President Palacio issued a decree requiring that all petroleum exploration and production contracts be renegotiated. Foreign investment in petroleum has been moribund for several years. Making matters worse for Ecuador, state-owned Petroecuador‘s production continues to decline (USDOS 2009). In 2006 the government enacted a ‗windfall revenues‘ law effectively increasing the government‘s share of oil revenues when prices exceed a certain level (Anderson 2009). In April 2008, Ecuador revoked nearly 80% of the country‘s mining concessions. This was done in order to enforce stricter environmental controls and increased royalty payments (Earthworks 2009).